Kate Middleton and her baby bump will make their final solo outing at the launch of Princess Cruises’ new ship, the Royal Princess tomorrow – and you can watch it live. 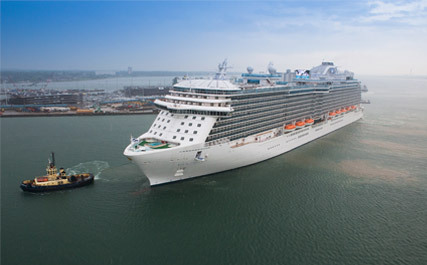 The much talked about naming ceremony during the Duchess of Cambridge’s visit to Southampton will be broadcast on the cruise company’s website at 11:15 am. Although Kate Middleton’s exact itinerary is yet to be released, it’s thought she’ll enjoy a brief tour of the shiny new ship – which boasts a 27 bars and restaurants, a 280-seat entertainment area and a glass-bottomed walkway – after the ceremony. And we think she’ll be impressed. 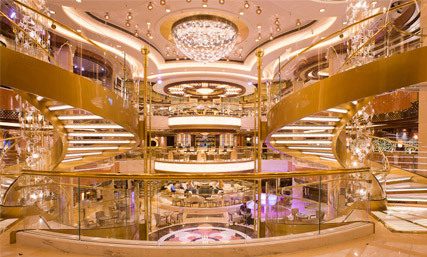 The 1,083 foot long vessel has the largest outdoor cinema at sea, two pools which transfer into dance floors come evening, and a glittering three-deck high golden atrium at the centre. Afterwards, insiders say Kate Middleton will host a glittering gala dinner, which will include guest from her charities. According to Duchess of Cambridge Style Files, teachers Danuta Tomasz and Dave Flowitt have been invited to dine with Kate Middleton at the celebrations, which come ahead of the cruise liner’s maiden voyage. After signing off from royal duties, Kate Middleton and her baby bump are expected to travel to her family home in Bucklebury, Berkshire to prepare for the new arrival.